We are already three races into what appeared to be a season where we’d finally see Ferrari break their championship title drought but, they’re suffering a similar fate to the one their closest adversary has in recent years - they have a car that’s difficult to get the best from at a given race weekend. If they’re to unlock the SF90’s full potential they may actually have to neuter some of its raw speed in favour of better apex speed and balance for the drivers, whilst also making ground on the silver arrows who have started to tame their own unwieldy beast. 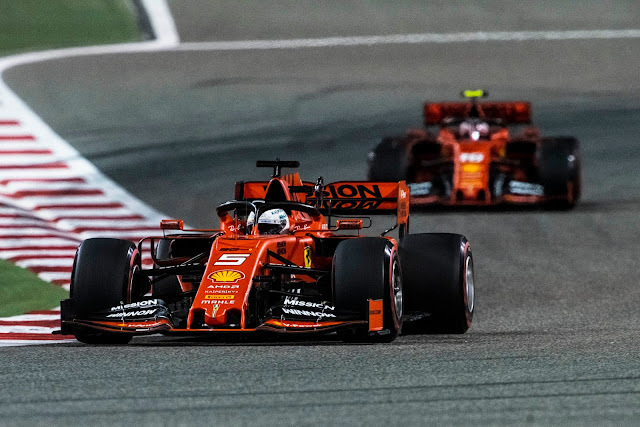 Make no mistake about it, both cars are leaps and bounds ahead of the competition and recent struggles from Ferrari have flattered the position of Red Bull relative to the pair in my opinion. Furthermore, Red Bull remain a disruptor in terms of strategy, taking the outside shot when possible in order to put themselves in the mix but really lack the pace if both red and silver cars were operating optimally. For me Ferrari have one of the oldest problems on the grid, getting these three aspects to work well in unison - tyres, suspension and aero. In isolation perhaps they appear to be working well but it’s the transitional moments that we’re interested in, the nuance of when one system leans on the other. When I’m sat thinking about Ferrari’s conundrum I’m immediately drawn back to testing and the apparent issues they were having with their suspension system. They were trying to push the envelope with a revised layout that they hoped would actually work better in the very circumstances we’re talking about, helping them both mechanically and aerodynamically. One of the most intriguing aspects of suspension design over the last few years is the ‘heave’ or ‘third’ damper, as it is the bridge between the aerodynamic platform and suspension and plays a pivotal role in the transient behaviour of the tyres as they deform. ‘Heave’ if you’re unaware is a suspension mode that relates to the combined (front and rear) vertical displacement of the car. Heave is problematic for open wheel cars, especially with tyres that have such large sidewalls as we have in Formula One. This is due to the fact that as downforce increases and the car depresses toward the track surface the tyre changes shape, which if left to its own devices can become detrimental to the aerodynamic performance of the car. The heave element is used and setup to counteract this issue and like the rest of the cars setup will be tuned to suit each driver and the prevailing track conditions. Of course just like with any system money spent on developing it will usually yield results and Ferrari have invested in finding performance here, especially as they knew that the change in regulations for 2019 could have a bearing on how they operated. In response to this it’s understood that Ferrari moved to an independent heave damper at the rear of the car for 2019, whilst also making the necessary adjustments at the front of the car to take advantage of any performance uplift. However, having encountered problems during the pre-season test I understand they had to dial back their approach and are currently looking for ways to regain their perceived advantage. Many column inches were devoted to the very different approaches taken by teams when it comes to their front wing designs for 2019. And whilst many were quick to judge the Ferrari/Alfa Romeo solution as the best, given it was the most aggressive, I tried to sit on the fence a little as Mercedes and Red Bull, two teams at the opposite end of the rake spectrum had stayed the course with a more conventional design. If either of them had chosen this more radical route then yes, fair do’s I’d sit and listen to it being the second coming but I still had to be convinced. The designs seen at either end of the spectrum are still essentially trying to do the same thing, just in a very different way, as they both look to mimic the outwash effect used for the last decade whilst making enough downforce to balance what’s achievable at the rear. So, we must discuss the primary reason why Ferrari opted for their design over what many would deem the conventional route taken by Mercedes and Red Bull and the main one would appear to be how they deal with the tip vortex. 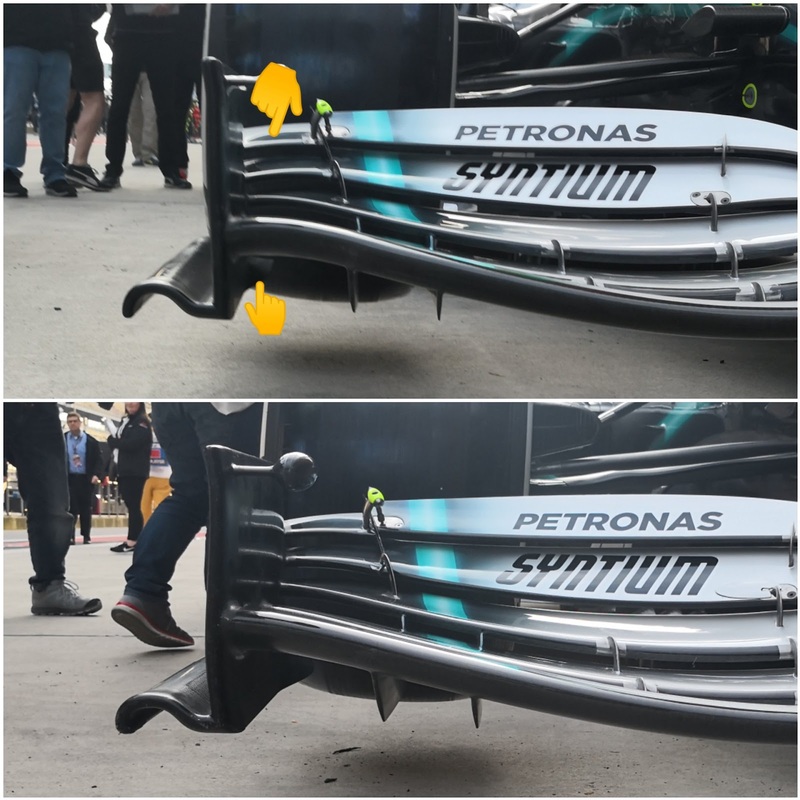 The vortex created by the 2019 front wings are much stronger than before due to the simplification of the endplate and loss of other flow diverting furniture, that would otherwise help to soften this vortex. Furthermore, the move to a wing which is as wide as the car also positions this vortex further outboard than is desirable, as previously it would have helped to pull airflow across and around the tyre differently. When I say it’s undesirable, I mean undesirable to the designer, as the flow structure is counterproductive to producing flow downstream. It makes creating the type of outwash that was possible under the previous regulations nigh on impossible, with airflow drawn in much closer to the car as it moves downstream. This is a win for the rulemakers as that means the wake created by a lead car has a much smaller footprint and is why we’re able to see cars run a little closer to one another this year. 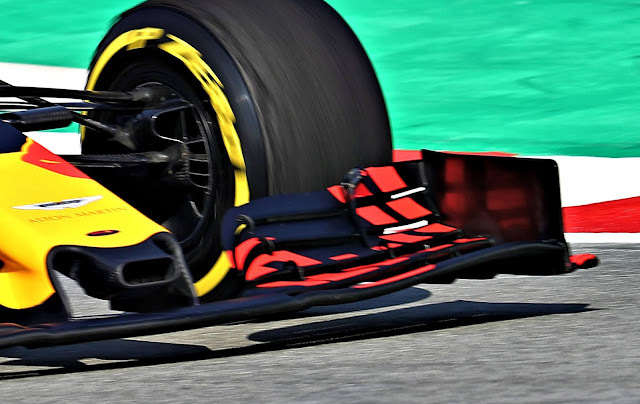 The design favoured by Ferrari, Alfa Romeo and Toro Rosso sees the flaps arch over and connect with the endplate at a very low height (see the yellow mark for a visual idea of how low the flap/endplate juncture is, a feat more exaggerated on the SAlfa). Perhaps overlooked so far in everyones generalisation of these wing shapes is that the flaps are also essentially flat by the time they meet the endplate. This would suggest that these teams are trying to propagate a vortex that’s not only shed lower down, lessening its vorticity, but also being forced to rotate differently too. It’s not as simplistic as that (of course) as there are many other flow conditions to consider at this juncture too, including but not limited to the low pressure flow beneath the wing, the design of the inner and outer footplates and also the position of the strakes beneath the wing. We must also then consider how this arched style flap arrangement impacts downforce creation and the subsequent direction of flow that's cast off it, whilst also bearing in mind the shape, direction and vorticity of the Y250 vortex as it still plays a significant role in how airflow moves down the central portion of the car. As a matter of comparison let us take a look at Red Bull's wing, as they've opted for the more conventional full flap arrangement that meets high up with the endplate and essentially encourages the strong tip vortex to form that Ferrari have discarded. Now, those that have this design have started to soften their approach, with Red Bull and Mercedes having used notches in the upper rear corner to displace the vortex, almost in a similar way to how you see teams do so on their rear wing endplates. 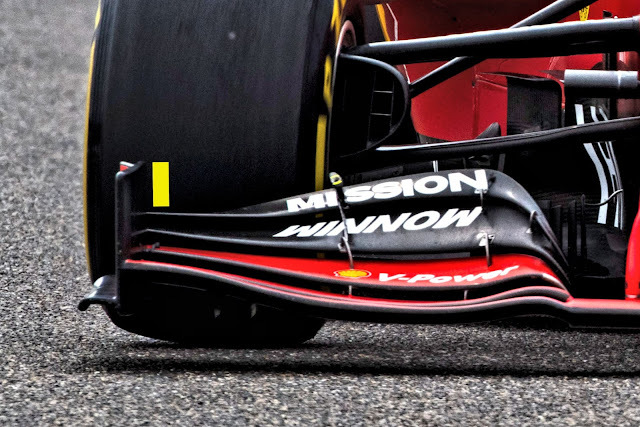 The interesting thing for me here is that the teams that favour this fuller flap solution seem keen to not only harness the tip vortex but also utilise the airflow cast off the flap to shape the wake created by the upper portion of the tyre, something that the Ferrari/SAlfa/STR solution sacrifices. Meanwhile, we have a large collective of teams that are trying to have their cake and eat it, with halfway house approaches that take into account both aspects but don't fully deal with them at the far end of the spectrum. After some digression I think it’s fair to say that the Ferrari/SAlfa/STR approach leaves them a little wanting when it comes to the amount of direct downforce generated by the front wing, meaning they can’t quite get the car on the nose as much as some of their counterparts in the corners and front axle load is obviously quite pivotal when we come to generating heat in the front tyres. So, I think we now have to wander into tyre territory, as whilst recent studies and comments have pointed a finger at the SF90 not being able to generate enough downforce I also think their relative tyre performance is a little lacklustre too. The first things to think about when we talk about tyres in 2019 is that the game has changed a little compared with last season, with Pirelli opting to use the thinner gauge tread they used at several races in 2018. Furthermore they’ve reduced the tyre blanket operating temperature at the rear of the car but not the front and obviously we must consider that each of the compounds has its own temperature window, meaning we’ll also get a variance in performance from tyre-to-tyre. I know the obvious statement is that all of the teams must overcome these issues but I think Ferrari are having the edge taken off their performance due to the way their operating their tyres (due to their suspension and aero inefficiencies). Furthermore, if we look at the three circuits that the teams have visited thus far I think it exposes the cars fragility's, with it unable to work efficiently when it’s bumpier or the track has a coarse surface. Meanwhile the lack of front axle load means the tyres aren’t being heat cycled correctly and this becomes damaging not only over a single lap but even more so over a race stint. I've tried to generalise some of the issues in this article in order that we cover a lot of ground and as you've probably come to realise I don't think they have one specific issue to deal with in order to unlock the SF90's potential. However, I don't think these issues are insurmountable either, it's just about how much ground they'll have lost by the time they get to a competitive state, especially as Mercedes have got on top of their own issues in double-quick time. I would hope that the team have a large package of parts in their schedule that'll be ready for the return to Europe and that we might see both Ferrari and Mercedes go toe-to-toe from theron. 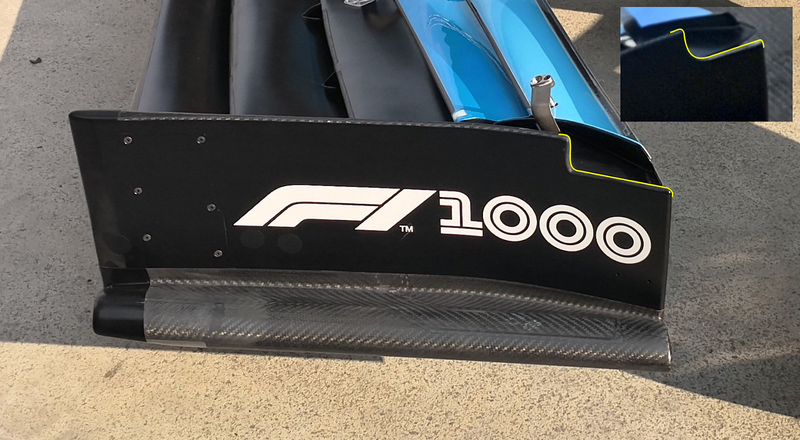 The FIA have tackled several of the teams front wing designs in China, tidying up a few of the design discrepancies that have shown up in the opening few rounds. The teams affected are Mercedes, Red Bull and Williams, all of whom have chosen a front wing design on the same end of the 2019 spectrum, utilising almost full height flaps as they intersect with the endplate. 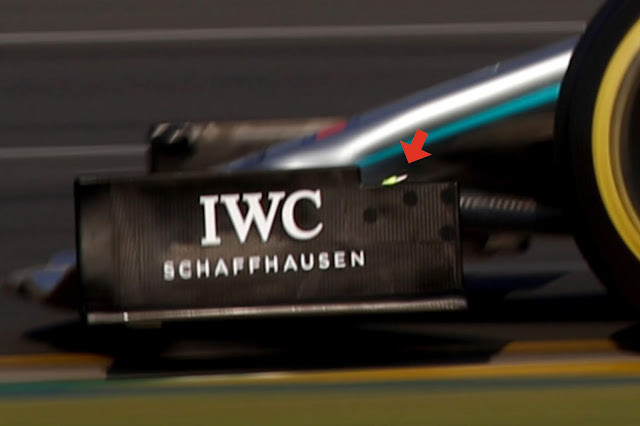 As shown on the Mercedes W10, in the image above, all three had trended toward a rearward cutout in the upper corner of the front wings endplate (red arrow) in order that the high energy vortex that was being created here could be quelled. With the more traditional front wing design used by the teams at this end of the front wing spectrum the shape, position and actual vorticity of this vortex is not only piviotal to the vortex in question but also the other vortices being created to try and influence the wake shed by the tyre behind. This is the primary reason why the teams moved to this style of cutout, adjusting the pressure gradient as the rearmost flap intersects with the endplate. In order to prevent tyre damage to other cars, the complete endplate, with the exception of parts of the second volume inboard of the virtual endplate surface must be at least 10mm thick (being the minimum distance when measured normal to the surface in any direction) with a 5mm radius applied to all extremities. This may seem like a minor infraction but allowing Williams to continue with this different radius on that corner would have invited similar design intpretations by other further down the line. Meanwhile, over at Red Bull they had a different conundrum to overcome, as whilst the radii on the corners of their cutout was compliant, the design ran foul of another element within the regulations relating to what we'd see of the flaps if viewed from the side. Once the front wing profiles have been defined, they must be trimmed by the virtual endplate surface defined in Article 3.3.5, and the portion of the front wing profiles outboard of that surface must be discarded. Where the front wing profiles intersect the front wing endplate, a maximum fillet radius of 10mm may be applied. This excerpt from 3.3.6 of the regulations suggests that the wing profiles must be trimmed to match the virtual endplate and anything other than that must be discarded. 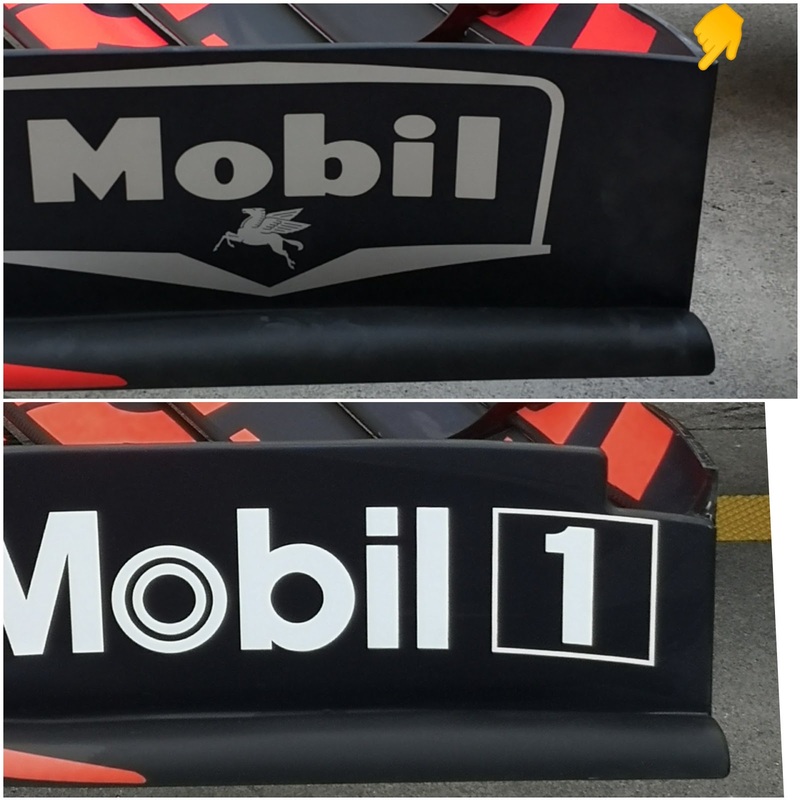 As we can see in Albert's lower image, Red Bull continued to run with a full flap arrangement in the outboard section of the wing, which can be seen due to the endplates cutout. There is some leeway here, as the physical endplate can be upto 6mm distant from the virtual endplates full dimension and only need take up 95% of the virtual endplates entire footprint. To become compliant Red Bull have opted to run an endplate design without the cutout for the Chinese GP. This brings us full circle to Mercedes updated front wing design for the Chinese GP, which features several revisions, including an alteration to the shape and position of the mainplanes leading edge as it intersects with the endplate. It's a change that has an impact on the flaps that reside behind too, altering their shape as they intersect with the endplate. The new endplate (bottom) deals more elegantly with the cutout solution and will garner a different response from the vortex, but like the Red Bull's design from the first two rounds it exposed the flaps. 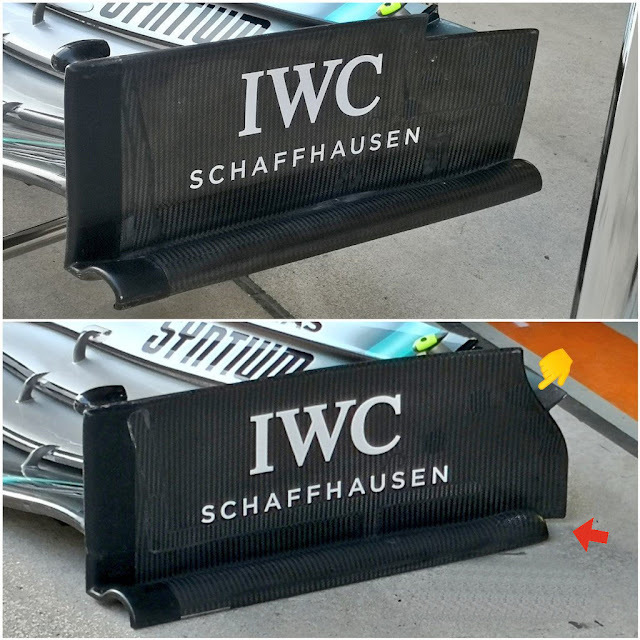 The FIA spoke to the team and the flaps were subsequently trimmed to suit the shape of the endplate, bringing them inline with the regulations and a technical directive that had been issued on the matter over the last few weeks. You'll also note the change made to the footplate which has been shortened and the arc shape altered at the rear in order that the vortex shed works with everything else that has been changed as part of the redesign. Once again, the winds were howling through the paddock, destroying expensive coiffes with gusts up to 30 mph and wreaking havoc on VIPs and race strategy alike. Turns 4 and 10 will see the most excitement from the wind unsettling cars and sending them wide with delightful abandon. One stop is Pirelli's call for fastest strategy, followed closely by a two stopper and a close look at new tyres left certainly leave to door more open for Ferrari to employ the 2 stopper than Mercedes on this high degradation, rear limited circuit. Of course, the real object of interest will be turn 1 and whether or not Leclerc and Vettel will simply make it through intact, and, of course, in what order. Red Bull, too, might play a spoiler role with alternate strategies as they have struggled with the Softs on which Verstappen will start the race. Mercedes was better on the Softs, with Bottas managing a higher average over 17 laps than Ferrari over 13 and it was Ferrari over Mercedes on the Mediums again suggestive that we might see different strategies as the realities of the race play out. In the midfield, HAAS continue their reign on one lap pace, but according to the long run analysis they are quite vulnerable. With Grosjean dinged 3 spots for blocking Norris in quali, it's going to be a difficult race for them to score double points as Kmag's, ummmm, robust defending skills will be of less use on one of the easier tracks to pass that now also sports 3 DRS zones. Looking fast on race pace as well are Kvyat of Toro Rosso and Hulkenberg at Renault, but they start from far back and if they get caught in traffic it will make for a long day. McLaren are actually the dark horse for best of the rest as they have decent race pace and good starting positions so happy days for their long suffering fans. Lights Out!!!! Great start from Vettel as Leclerc caught some wheelspin and it was Vettel into P1 out of the first turn. The bad news for Leclerc continued as Bottas took advantage of his poor start and was by after slipstreaming down the long straight to T4. Hamilton, too had a go but Leclerc had recovered his sanity by then and it was nothing doing and it was fierce fighting amongs the top 3. A feint from Leclerc caused Bottas to flinch and it was Leclerc by in a flash and then Hamilton squeezed by as well and as the dust settled from the mad start it was Vettel 2 seconds up on Leclerc, followed by Hamilton and Bottas. Further back it was Grosjean and Stroll coming together, sending them both to the back and a puncture for Grosjean to boot. Norris also didn't escape unscathed, having a bit of rally practice which dropped him several places as well during the utter chaos of the start. In the midfield then it was Sainz with the better start and ahead of Magnussen, but it was Raikkonen being pressured from Ricciardo and in turn putting the issue to Magnussen who was already starting to lead his own train. Lap 10 brought Raikkonen, Albon and Gasly in. Gasly was out again on the Soft tyre, but it was slow and he lost roughly an additional 3 seconds, not helping his aggressive strategy. Raikkonen onto the Medium and Albon back out on the Soft, mirroring Gasly's strategy. K-Mag was next in, lap 11 and out with a set of Mediums, back into P15 but successfully defending against the undercut from Gasly. Lap 12 saw Verstappen in and out with a set of Mediums on while it was Kvyat, running long and fast, up to P7 thanks to the stops. And just like that he was backwards, possible due to Giovinazzi contact as he tried to defend the overtake and once he got turned around, into the pits he went. Bottas meanwhile was in and out, and behind Verstappen whilst Hamilton had rocked up to just behind Vettel. Lap 14 saw Hamilton into the pits, following Leclerc who led the way. Mediums for the Ferrari and Softs for the Mercedes as Bottas was having a serious go at Verstappen into T1. He didn't quite get the move done but he kept at it and around the outside he finally went, off in chase of Vettel, who had pitted in the the following lap and lost out to Hamilton's undercut, leaving Ricciardo at the front of the race for the moment. That moment passed quickly as Leclerc and then Hamilton swept past him, the Mercedes driver again yo-yo-ing 3.5 seconds off the back of the Ferrari. Vettel was at 7 seconds and Bottas another 2 behind him on lap 17 as the front of the field struggled for equilibrium. In the midfield, K-Mag was in DRS of Gasly for P11 briefly, but it was the Red Bull on the charge trying to reclaim the damage from his slow stop as Kmag was confirmed on a one stop, trying to make it work against those 2 stopping ahead. Grosjean threw in the towel, likely due to damage from his punctured tyre and that left Sainz as the lanterne rouge, chasing Stroll at a second a lap on lap 20. At the sharp end, Leclerc was beginning to turn the screw a little bit, knocking off 3 to 5 tenths a lap as Hamilton struggled to get the pace out of the Softs relative to the Mediums. This dropped him back into the clutches of Vettel who was just a second back on lap 21. Hamilton radioed in that his rears were done, the high rate of degradation doing in his gamble to get by Leclerc with the softer tyre..... Verstappen P5 was in his pit window and the question for Mercedes strategy was how long could he stretch it before they brought him in for a tyre advantage to the end of the race. That would leave Bottas on a potential 1 stopper keeping Ferrari honest at the front as he was 16 seconds back and VERY much looking like he was running a pace to make his Mediums last. Lap 23 and Vettel got the job done leaving Mercedes' aggressive strategy a bit in disarray. A mistake from Vettel opened the door back up, and despite his lack of grip and tyres going off, Hamilton was not losing a lot of time over the lap. The following lap, though, he began to edge it out and it was Ricciardo, with a long 25 lap first stint, in for his pit stop. Out P13 he went, just behind Kmag, who was now focused on staying in the pit window Hulkenberg while saving his tyres, with Ricciardo looking to close the 5 second gap as quickly as possible. Good news for Kmag, Albon was into the pits, opening up some free air for him to drive into. Slightly further up, Norris had finally reeled Raikkonen in, and was by for P7. Kimi kept the fight going for a bit, but Norris had the measure of him and was off in search of Hulkenberg, 3 seconds up the road. Hamilton was dangling 2 seconds off Vettel, but behind him Bottas continued to bleed time and his ability to keep Ferrari from an easy 1 stop had almost evaporated. Lap 30 saw Ricciardo by Magnussen without much of a sweat and putting a big dent into HAAS one stop plan and pointing out that Pirelli did have the correct fastest strategy pegged. 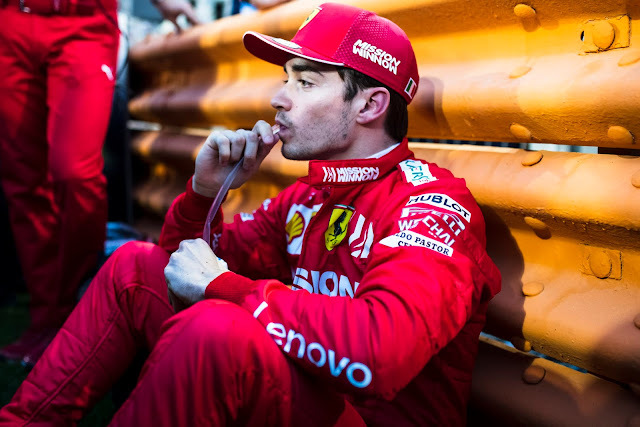 But it was Leclerc at the front, who had even outdriven TV coverage 8 seconds up on Vettel and bringing a valedictory performance. In a deja vu all over again moment, after Verstappen lapped Stroll lap 32, Stroll came back and decided to unlap himself, this time without all the excellent crashing of Brazil. Hamilton had a moment, but it was first Verstappen who came in on lap 33 to grab a new set of tyres. Out with a set of Mediums he went, and it was Hulkenberg also in, back out just in front of Magnussen as HAAS' race day was officially in tatters. Verstappen was out behind Raikkonen, and he wasted little time getting round and then it was Norris, next on his radar 2 seconds up the road. Lap 35 and Hamilton was in, out behind Bottas. The pass by the Red Bull also saw Raikkonen bailing for new tyres and he emerged into a fierce battle with Albon, which Kimi eventually won. This battle sent Albon back into the clutches of his teammate. Vettel was in lap 36 and was out just in front of Hamilton, under a second between them and the battle was on to the end of the race. Leclerc was in the following lap and out, back into the lead, about 2 seconds up on Bottas. Fast lap for Hamilton, meanwhile, and surprise, outside of T4 he went with Vettel fighting back, squeezing him hard and saving his place for the moment. They caught Bottas up and that gave Vettel the gift of DRS which momentarily saved the place. Again into T4 Hamilton went round the outside but it was Vettel, fully behind on exit, spinning on exit as Hamilton launched off into the distance. But the tragedy continued as he then lost his front wing on the way round to the pits, and it was P10 on exit with the Softs for the remainder of the race. Lap 39 and Hulkenberg was on the back of Ricciardo and into T1 they went with Ricciardo understeering into Hulkenberg trying to defend and losing his front wing endplate for his troubles. Ricciardo tried to fight back down the straight but he wasn't able to get close enough into T4 and that was that as Hulkenberg had a big tyre advantage as well as Ricciardo carrying damage from their contact. During the wars, Bottas had been brought in for a set of Softs, clearing up their thinking on his strategy. The fresh tyres were enough to keep him moving a bit faster than Verstappen, which looked to be enough to get him home in 3rd. Lap 47 and Leclerc was on the radio, complaining of problems with the PU and it was confirmed they had lost ERS from the team. Suddenly, with 10 laps left he was losing seconds a lap and it took Hamilton no time at all to take advantage. He sailed past with no fight whatsoever on lap 48, Leclerc's MGU-H toast and the only question left was whether the buffer to Bottas was enought to keep him on the podium. The maths didn't look good as he was losing 5 seconds a lap with 7 laps left. The race gods were being exceptionally cruel today to the young Monegasque, and he was told to get on with it and try to get to the end on the podium. A brutal radio conversation followed, with Leclerc being told to follow the numbers on his dash, as he protested the near impossibility of what they asked. All the while, Bottas continued his inexorable pursuit. In the midfield, Renault's day went suddenly sideways, as Hulkenberg suddenly suffered as first Hulkenberg, and then Ricciardo turned up at the end of the straight as their cars just shut down. Hulkenberg with a PU issue and Ricciardo with what seemed to be an electrics failures. OUCH...... This promoted Norris to P6 as best of the rest and then the rather rare Safety Car was deployed as the 2 cars were recovered and it looked rather likely that they were going to finish that way. No surprises then, as the checquers fell with Hamilton, Bottas and Leclerc on the podium, a bit of saving grace for Ferrari, followed by Verstappen and Vettel. Formula B was led home by Norris, followed by Raikkonen, Gasly, Albon and Perez. The red light on Ricciardo's car was lit as the field rolled by last time, meaning that it was unsafe to touch without specialised gear. Grim result for Ferrari, another inexplicable failure with the race win in their grasp and the questions will continue to reverberate through the Scuderia's firmament until China. Right now all that is know is what failed, the why of it will be the focus. A bigger question will be Vettel's lead driver status, not just slower on the day, but with another high profile spin in wheel to wheel combat with their main rival now to be considered in Maranello. Binotto was firm that a change in leadership was not yet at issue but after such a dominant performance it will be hard not to hear the whispers. Happy days for Mercedes as 2 wins from the off put them in a good position in the championship and it's Bottas still with the lead, as his single point for fast lap kept him in the lead headed into the 3rd race of the season. But it was also clear that had Ferrari not had reliability issue, there is no chance that Mercedes was on the top step of the podium, and their lack of straightline speed relative to Ferrari doesn't augur well for China, with it's massive backstraight. In the midfield it was mixed for Mclaren, good news that Norris nailed a haul of points but lots of what might have been for Sainz. About Renault with a double failure the less said the better, and even at HAAS it was grim, with Grosjean taken out by contact with Stroll on the opening lap and the abject failure of their one stop strategy taking them very thoroughly out of the points. Green Light!! Albon was first out, followed by Russell and then Kubica who was still suffering from mysteriously less downforce than his teammate at Williams. Kubica was first on it, but he dove back into the pits leaving Albon to set a 1:31.125 with Russell a bit more than a second back of that. Most of the rest were waiting for track temps to hit their optimum for getting the tyres into the sweet spot. Norris was the next ot join the party around 13 minutes and then the trickle became a flood, with just Red Bull holding out till around the 11 minute mark. He was setting the board alight with purple as he wove through 18 cars all on their outlap. Up to P1 but severely balked into the final turn by Grosjean just setting off on his hotlap. Bottas was first of the top teams to cross the timing beam in a 1:29.498 but he was immediately eclipsed by Leclerc an entire second quicker!!! Yoicks!!! Hamilton was nearly a half second back of Bottas and it was Vettel, 0.238 seconds back that was closest. Magnussen was just pipped by Sainz for best of the rest, 0.004 seconds between them and as things transpired, it was Grosjean under investigation for blocking Norris. Hamilton took advantage of an empty track to improve to P3 0.7 seconds off Leclerc and P3. Bottas took to the pits and rocked a new set of tyres as the rest of the field, with under 3 minutes left, was back out and onto their outlaps for the final efforts to taste the sweetness of Q2. Q2 kicked off with a whole lot of nothing, as teams were still waiting to force others to continue cleaning up the track. Rogro blinked first, leading the parade followed by Mercedes and then pretty much the entire rest of the field with just 12 minutes left on the clock. No sign of alternate tyre strategy from Ferrari which might've been the only team in a position to play that card and the cars rolled around. Bottas chose to pass Grosjean whilst Hamilton went the other directions and kicked off his lap, well behind Kmag and 4 cars further back from his teammate. The board was full mainly of green but it was Hamilton behind cleaning up the purple sectors ahead of the Ferraris. Vettel and Ricciardo both in the way for Bottas through with a 1:28.83 and P1. Hamilton managed do better by 0.252 seconds and early days it was Kmag P3 and best of the rest by a tenth and a half. As the second half of the field got into it, Leclerc was looking mighty and through he went, half a second up on Lewis. Verstappen could only split the HAAS pair, behind K-Mag and ahead of Grosjean and then it was Vettel, in with a mystery P6 0.6 back of his teammate, either a mistake or traffic no doubt. Replay showed not only a massive lock up, but a lengthy stint stuck behind Ricciardo as well and there you go. On the outside looking in were Ricciardo, Gasly, Kvyat, Albon, Perez and Giovinazzi, with Gasly suffering the most discomfort in the hot seat at Red Bull. Vettel would be back out to cover, if not actually set an actual time, and it was Grosjean, kicking it all off with 3:45 left in the session. Kmag followed him out and then it was a cast of thousands from the midfield. P9 from Rogro was a far shout from P4 for Kmag so a bit of pressure for the Frenchman. Again a whole lotta nothing until nearly a minute, then it was Norris, Frosjean, Kmag, Raikkonen and Sainz. Raikkonen apparently wasn't pleased with Kmag's pace and he was by before T4. 13:30 and it was Bottas and Hamilton out of the gate. Horner was interviewed and was on at length about their struggles to get the Soft tyre into the sweet spot and no doubt they weren't the only team to struggle as track temps had dropped into the upper 20's from the start of the session. Magnussen was cleaning up purples from Grosjean as he was halfway through S2 and as they crossed it was Grosjean, then Kmag going one better with Sainz slotting in between. Hamilton continued to have the pace over Bottas, but barely and it was Hamilton with 0.145s and a momentary P1, but Leclerc on the charge. Oooooh it was a 1:27.958 and P1 (0.232 seconds ahead of Lewis) with Vettel sat in the pits and only 1 set of fresh tyres to use thanks to his adventures in Q2. Verstappen as well chose to sit out the banker runs and as they teams turned it around for the ultimate tilt at the glories of pole, the tension mounted. It was Raikkonen who led the charge for the final runs, with Vettel kicking off the sharp end with his only venture, trailed by the Mercedes duo. Raikkonen, Norris, Grosjean were off and they were lighting up the board green. Behind, Vettel was chunking up the purples but still just off Leclerc's time halfway through. Behind, it was Leclerc just eclipsing Vettel though, taking S1 massively as Vettel could do no better than P2. It was a battle between the Mercedes and Bottas could not topple Hamilton's previous time whilst Hamilton himself could do no more and it was only Leclerc, improving to a 1:27.866 who showed any improvement and that by nary a tenth as the track temps had dropped below 28°C. Gonna be quite the race tomorrow, with the start key for Vettel and his WDC drive and with Hamilton in P3 it could be quite shouty through the first few turns. On race pace, Ferrari looked to have a small advantage, but the tires will very much dictate strategy as at the start of the race it will be degradation limited, but for the pit stops it's very much down to drivers being able to get the tire into the sweet, given the track temps will be dropping throughout the race. Kmag finished P6, best of the rest and an unbelievable 0.005 seconds off of Verstappen. Which, given Red Bull's struggles with getting the Soft tyre into the window isn't that much of a surprise, but if they don't crack that nut HAAS and Magnussen, not the easiest person to pass, let's be honest, are decidedly in a position to make Max's life even more challenging. McLaren have a lot to be happy about as well, and with Sainz and Norris starting in points paying position it's Renault with the most work to do. Look to Ricciardo/Hulkenberg to split tyre strategy as Ricciardo seemed to have a good start in Melbourne (too good one might say) and making up a few places will chuck him right into the midst of the fight while further back. Again, long running midfielders might create unexpected opportunities but with 3 DRS zones it's less likely that the field will flip due to someone nursing tyres to a ridiculous degree.